One of the goals that I had in mind when I started this site was to highlight and reward purposeful quality work, featuring not only my own projects but those of other dedicated and passionate craftsman. I was lucky to meet many of these such people when I went to school for gunsmithing in 2015. One of these people was Chris Wooldridge, who was a good friend and peer to me in school and who has turned out some amazing and inspired work. I know that Chris has a deep passion for the art of gun craft and I am excited to see the work he does in the future. I am happy to be able to present this story as it was sent to me by Chris (contact information at the beginning for those who want to reach out to him and his custom shop). I was born and raised roaming the woods of southwest Georgia hunting squirrel, the Eastern Wild Turkey, and of course, the ubiquitous Whitetail Deer. An old Browning A5 clone, chambered for 2 ¾” 12 gauge shells with a full choke, built by I company I cant remember was not my weapon of choice but it was what I had. I dreamed of the day I would own a real deer rifle but at 15 years old funds for such a purchase were elusive. My father, God bless him, was pursuing a Master’s Degree full time, so we were living on my Mother’s teacher’s salary. My father wanted to get me that rifle, but times were lean, and the family had financial priorities and a new rifle for me was not one of them. The hunting season of my 15th year was a successful one that saw two doe and one spike buck fall to that old shotgun, but the desire for a real rifle still burned. That spring my Father met and became friendly with Mr. Rafael Sanchez, who at the time, was the lead Park Ranger at Andersonville National Historic Site in Andersonville, Georgia. This acquaintance afforded me the opportunity to work at the park as part of the National Park Service’s Youth Conservation Corps. Daddy told me that this was my chance to finally get the rifle I wanted and have it before the next deer season. I jumped at the opportunity. With the money earned during the summer of my 16th year, I bought a brand new Winchester 94 chambered in 30-30 Winchester! I hunted with the rifle for the next seven years. I can’t count the number of deer that fell to that little rifle, but by the time I was 23, fresh out of the Army and in college, I desired something bigger, more powerful. One hot summer afternoon in Americus, Georgia I was in the local sporting goods store and on the rack were three Winchester Model 70 rifles all chambered in .30-06. Two were stocked in fine, high gloss walnut, with price tags commensurate with such quality. The third was the “budget” model. It was a model 70 with that fine Winchester action, but it was blued to a matte finish and was stocked with a black plastic stock. For my budget, this rifle was still pricy but affordable. I had $1000 to my name and the $425 price tag was still high but I figured I could swing it. I bought the rifle then and there because I knew that to wait would most likely result in me changing my mind. The little 94 was effectively retired and the Model 70 has accompanied me to the field from Georgia to Texas and has killed Mule Deer and Elk in Colorado. Five years prior, a high school buddy of mine introduced me to an “old man” named Ray Zubak. Mr. Zubak was, to me, a man among men. Mr. Zubak was a World War II veteran who served in the Pacific as a U.S. Navy Seabee taking part in the invasions of Iwo Jima and Okinawa. After the war Mr. Zubak had a very successful career in construction in south Florida and retired to the country, settling in my small home town of Buena Vista, Georgia. Mr. Zubak was a wealth of knowledge. He obviously understood construction. He was also well versed in auto mechanics, particularly the Volkswagen. But what impressed me the most was his knowledge of wine making, gardening, the woods and hunting, and of course firearms. It seemed to me that there was nothing Mr. Zubak didn’t know about guns and reloading. I eagerly soaked in anything and everything he had to say, and he never steered me wrong. I firmly believe he and COL Jeff Cooper would have been good friends. Mr. Zubak’s favorite rifle was a Remington 700 chambered in .35 Whelen. He swore by the big .35. He engrossed me with the history of the rounds development. How COL Townsend Whelen and Mr. James Howe took the pervasive .30-06, necked it up to .358 and the result was a powerful medium bore cartridge that was capable of taking any and all game on the North American Continent. (NOTE: in the 1940 book The Hunting Rifle: Design, Selection, Ballistics, Marksmanship, COL Whelen gives all the credit for the development of the round to Mr. Howe) Mr. Zubak maintained that, while it didn’t shoot as flat as the .30-06, it was in his opinion far superior. In 1995, I graduated college and was commissioned a 2LT of Armor and, after the Officer Basic Course (now called BOLC: Basic Officer Leaders Couse), I was sent to Korea. My Army career took me many places far from home and, much to my continued regret, I lost contact with Mr. Zubak. In 2008 I was home visiting before moving to Fort Carson, Colorado. My father told me that Mr. Zubak was not well and I should go visit. I went to visit him and found that he had already begun selling or passing down his gun collection. I asked him about the old Remington and he told me that my old high school buddy, who was also in the Army and stationed in Alaska, bought the rifle three years earlier and had already killed several bear, Moose, Caribou, and sheep. Mr. Zubak passed away two months later. In 2014 I was TDY to Fort Meade, Maryland. I called my old high school buddy to find out if he still had the rifle. He said he did but he had retired it and he was now shooting a rifle chambered in .338 Winchester Magnum. It seemed that Mr. Zubak had shot the gun so much that the old girl was suffering from throat erosion and accuracy had gone from decent when he got the gun, to abysmal. I was just happy he still had the old gun! After my retirement from the Army, I enrolled in the gunsmithing program at Piedmont Technical College in Greenwood, SC. With the memory of Mr. Zubak ever present with me, I decided to completely rebuild my old Winchester 70 and chamber it in .35 Whelen in his honor. It is my opinion that EVERY rifle should be equipped with iron sights. Optics get damaged. If you are 12 miles in the back country of the Rocky Mountains and this happens, you are now the camp maid. If you are in combat and an optic goes down with no back-up iron sights, you are combat ineffective. Neither scenario is good. One of the last things I did during first semester was strip the Winchester down. I pulled to old stock (which by now I had painted a hideous camouflage), stripped the bolt, removed the fire control group and removed to old barrel. All machining was done at the end of second semester. The biggest requirement for graduation from Piedmont Technical College’s Gunsmithing Program is the successful build of a custom rifle to the school’s standard. Part of that standard requires that the project rifle, as it is called, be chambered in .30-06. The reason for this is purely logistics. As a result, the school didn’t have a very important tool I needed to fit and chamber the new barrel using the technique I had been taught, and that tool was a range rod of the correct caliber. The school had plenty of .308 range rods but none of the .358 variety. The range rod is used in conjunction with the 4-jaw chuck to ensure the gunsmith is turning, threading, and chambering concentric to the bore. 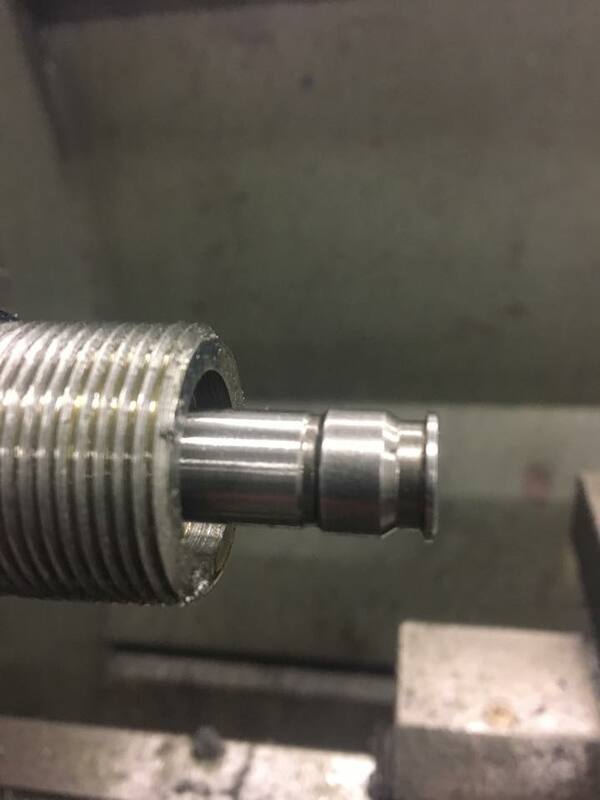 Machining concentric to the bore is an absolute necessity if you want any accuracy from your barrel. The lack of an appropriately sized range rod presented a major problem and simply ordering one was not an option due to an eight-week lead time for production and shipment. One of our instructors by the name of Bill Jacobs of Bolt and Barrel Gunsmithing, LLC, showed me the method he uses to re-barrel rifles. He fits and chambers between centers utilizing a steady rest. I still prefer to indicate off a range rod utilizing a 4-jaw chuck but Mr. Jacobs method is effective. Once fitting and chambering was completed, I coated the barreled action in Hold (brownells.com) to prevent rusting and stored it away until fourth semester when the project would be completed. The picture Chris sent of his machining setup in the steady-rest, one common way of chambering rifle barrels. Barrel threads cut and a gauge inserted to check chamber depth and headspace. Mid-October 2017 found me at my bench with all the parts to the Winchester, to include the new stock laid out in front of me. This project would mark the first time working with laminate. I knew what the stock was supposed to look like from pictures on Richards Microfit’s website but what was on the bench in front of me was defiantly not what I had in mind. The web page showed a stock that had rich earthy colors of red, brown, grey, and orange. The stock in the pictures looked just like the Appalachian Mountains when the leaves are in full blaze. The stock before me was dull and the colors were not “earthy”. I was convinced that there had been a mistake and Richards had sent the wrong stock. But as with the range rod dilemma I discussed above, I had no choice but to use this stock because I did not have time to send it back and get a replacement. This was disconcerting because, like an artist putting paint on canvas, I had a theme in mind for this rifle. I wanted anyone who saw this rifle to be taken in their minds back to the deer woods on a cloudy crisp fall day. The stock would represent the brilliance of fall leaves and the sniper grey would represent the steel grey clouds that accompany cold fronts that always seem to get the deer moving. I was hopeful that once the oil finish was applied, the oil would bring out the fall colors I was looking for. So, I began final inletting of the action, inletting the barrel, final shaping, sanding and finishing. It was on this stock that I learned the nuances of working with laminate. Laminate in many ways is much easier than working with Walnut but it defiantly responds to carving and sanding differently. It is imperative that all dust from sanding be cleaned before proceeding to the next grit. When working with laminate you must realize that rasps and files cut deeper in laminate than in traditional gunstock wood. When sanding, laminate produces a finer dust than walnut and that dust will quickly fill any file and rasp cuts. If you don’t take care to clean the stock, you won’t realize the file marks are still there until the second or third coat of oil. At that point you will be forced to re-sand the stock down to the wood and proceed back through the grits (120-600). The Tru-Oil, however, did bring out the Autumn colors and I was amazed at how beautiful the stock was turning out to be. The colors really stood out, deep and rich. Once the stock was complete I took the barreled action to the mill, and with a Forster Universal Sight Mounting Fixture, I drilled and tapped the barrel to accept the Remington open sights. I then applied Cerakote (Sniper Grey) to the barreled action and associated metal parts. I hot salt blued the front sight post and the adjustable rear leaf to a matte finish. The dark grey really meshed with the deep rich colors of the stock and the small blued parts provided a wonderful contrast. Once Cerakoting and final bluing were completed, final assembly began. I performed a trigger job that took the trigger down from the factory 5.5 lbs to 2.75 lbs. The rifle was topped off with a Nikon Pro Staff 3X9 scope. The light trigger, free floated match grade barrel, bedded action, and quality glass produced exceptional accuracy! Once the rifle was complete I brought the rifle home and showed it to my 8-year-old son who exclaimed “Daddy, it has Thanksgiving colors!” That was exactly what I was looking for! I want to thank Chris again for sending me this story. It is a beautiful rifle with a wonderful creation story behind it and I think it is a rifle that will continue telling that story for years to come. It is a great example of purpose in craftsmanship and I'm glad to be able to share it. As stated above, Chris has opened his own gunsmithing shop (Swamp Fox Custom Rifle Works) and is taking business now. His information is listed at the top of the article. If you have a gun story you'd like to share, please feel free to send it to dakota.potts@gmail.com. Anybody can apply, whether professionals, hobbyists, or somewhere in between. The work can be done by you or another creator so long as the work was done for you and the craftsman receives credit for the work done.